If you can’t spend the whole summer floating all 75 miles of the Chain of Lakes, here are some spots that you absolutely have to see in Charlevoix and throughout the entire Chain of Lakes region. This white sandy swath next to the Elk Rapids dam somehow retains a sense of the untouched. 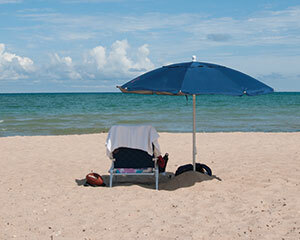 A great spot for fishing and swimming, located just steps from downtown on Dexter Road. elkrapidschamber.org. This eclectic museum, showcasing dioramas of taxidermied Michigan wildlife, is a classic Northwoods attraction. With its big selection of moccasins, deerskin gloves and other souvenirs, the gift shop alone is worth a visit. 11060 S. US 31, Williamsburg, 231.264.5597, northernmichigantaxidermy.com. 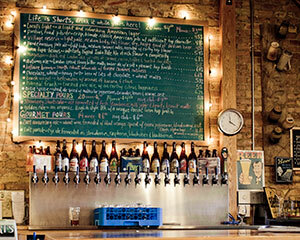 A renovated, century-old hardware store in Bellaire is HQ for one of the Mitten’s most beloved craft breweries. Epic beers, elevated pub grub, live music weekly throughout the summer. 121 N. Bridge St., Bellaire, 231.533.6622, shortsbrewing.com. This gem just north of Torch Lake’s northern tip offers a huge sandy beach on Grand Traverse Bay, plus family-friendly camping, a play area, and a network of hiking and biking trails. 12298 Barnes Park Rd., Eastport, 231.599.2712. The new family-owned winery at Royal Farms—a favorite local roadside fruit stand and market—specializes in vino that features fruit from the farm’s orchards. Try the Sassy Apple wine, which gets its sass from the farm’s own honeycrisps. 10445 N. US 31, Ellsworth, 231.599.3222, royalfarmsinc.com. This hatchery produces more than three million lake trout and brown trout annually for stocking waters around the Great Lakes. Free tours and a trail system for hiking. 6623 Turner Rd., Elmira, 231.584.2461, facebook.com/jordanriverNFH. 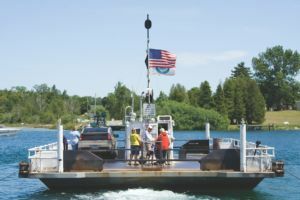 Take a trip on one of the shortest ferry rides in the world: the four-car cable-guided Ironton ferry, which transports cars, people and bikes across the narrows of Lake Charlevoix. Rates and hours online. charlevoixcounty.org.